Once that decision is made and our spiritual adoption is finalized, our Salvation is forever settled and rests Eternally Secure in the hands of our Heavenly Father. Through Worship that He brings our wills into alignment with the will of God. Once these changes start revolutionizing the way we feel, think, and act, it isn’t long before our perceptions of the world around us also begin to change. No longer approaching it from the self-centered, grab-all-that-you-can-get perspective of our pre-salvation days, we start looking at it from God’s viewpoint—that is, with a heart of compassion for those still lost in sin, and with a new desire to do something about it. Such changes in our character and outlook as these should come as no surprise, though, because they are a reflection of the attitude and characteristics of Christ which must be developed in us, if we are to carry out His work in the world. …God anointed Jesus of Nazareth with the Holy Spirit and with power [so that] He went about doing good and healing all who were oppressed by the devil, for God was with him (Acts 10:38). However, for us to be able to do even greater things than He—that’s a completely different story, isn’t it? …you will receive power when the Holy Spirit has come upon you, and you will be my witnesses in Jerusalem and in all Judea and Samaria, and to the end of the earth (Acts 1:8). …we are his workmanship, created in Christ Jesus for good works, which God prepared beforehand, that we should walk in them (Eph. 2:10). As for understanding what He may have meant by “doing greater works,” we must to remember that during His life on earth, and in spite of His being God, Jesus willingly chose to confine Himself to one body, living in one time and one place. As a result, His ministry of good works was confined to a limited number of people, living in one geographic area, during one brief period in human history. This all changed, however, following His resurrection and with the coming of the promised Holy Spirit. After that, as His newly-anointed disciples shared the Gospel with others and they, in turn, came to faith in Christ, the same resurrection life and power that the disciples had received was also manifested in these newborn Christians. Then, as more and more people became believers, and as these believers scattered throughout the then-known world, demonstrating the character and commitment of Christ as they went, the quantity and scope of Jesus’ works increased to a degree previously thought impossible—and resulted in an explosion of faith and service that continues to this very day. When thinking about service and what it means, it’s likely that a number of different images come to mind. 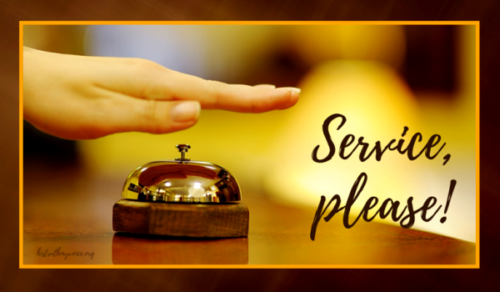 For instance, we might think of service as serving in the military, or as police officers and firefighters; possibly serving patrons their dinners in restaurants; or, maybe even serving the ball in a game of tennis. 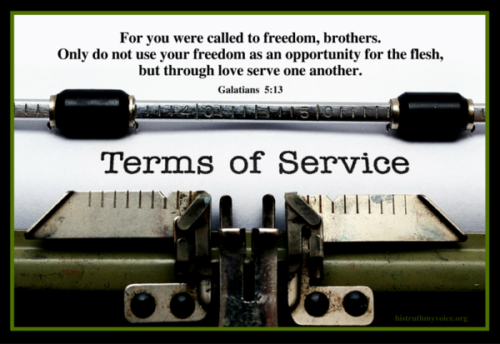 But, for those of us who are Christ followers, what does it mean for us to serve? Providing services that benefit or help others. 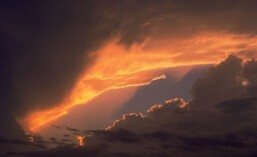 ..and, a surrender that each of us will be called upon to make as a routine part of our service. Every day, we will find that, as we are faced with the choice of doing things God’s way or our way, we will repeatedly have to make a conscious decision to climb back on the altar of sacrifice and submit our wills to His in a demonstration of our obedience and worship to God. If we don’t, no real work for Christ will take place; for, it is at the altar of worship that all service in His name originates. …I do as the Father has commanded me, so that the world may know that I love the Father. This is my commandment, that you love one another as I have loved you. Greater love has no one than this, that someone lay down his life for his friends. You are my friends if you do what I command you (John 15:12-14). By this all people will know that you are my disciples, if you have love for one another (John 13:35). …a promise which makes even the most impossible task or service do-able. So flee youthful passions and pursue righteousness, faith, love, and peace, along with those who call on the Lord from a pure heart…. …with the lesson here being, service done in the name of the Lord Jesus must always proceed from a pure heart and clean hands. With our wills surrendered to God at the altar of worship, with the love of Christ as our motivation, and with clean hands and pure hearts to keep us useful to God, we are ready to move on to the fourth aspect of service—which is, the provision of services that will benefit others. This raises the question, though, about the kinds of service we should be providing. After all, there are so many needs in the world that are going unmet, how are we to know which ones are the most deserving of our attention? …works which could be considered as the MDLA—or Minimum Daily Lifestyle Adjustments—required of each and every believer. Moving beyond these, though—that is, moving on to doing the greater works than those previously attributed to Jesus—will call for more than just our minimum daily lifestyle adjustments; they will demand the wisdom, direction, and anointing of the Holy Spirit, working through the cooperative gifts and prayers of all believers. In other words, providing Service for Jesus will require the active participation of the Church—something which we will discuss at length in our next exercise. 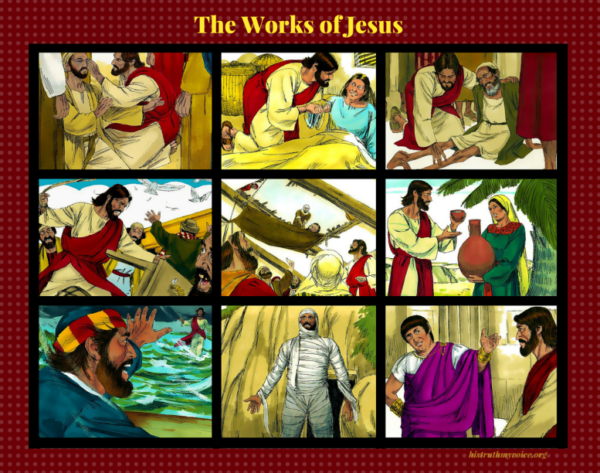 Images used in the Works of Jesus montage courtesy of http://www.freebibleimages.org. Posted in Biblical Reflections, Christian Living Reflections, Service Reflections, Workout Room Reflections. Tagged Bible Study, Body of Christ, Church, Eternal Security, God, Good Works, Gospel, Holy Spirit, Jesus Christ, New Birth, Prayer, Predestination, Salvation, Sanctification, Serve, Service, Worship Reflections. Salvation: Can We Lose It? Many years ago, I attended a church which staunchly supported its denomination’s position that a person can lose his salvation. Up to that point in my Christian experience, I hadn’t given much thought to the matter, probably because the thought that a saved person could somehow become unsaved had never occurred to me. However, since all I have ever wanted to know is the truth, I decided to try and keep an open mind about it, at least until I could search the scriptures for myself. As I started thinking about it, though, the idea of a person losing their Salvation began to seem like a very far-fetched and highly illogical one. I mean, if it was possible, at which point would that person cross the line? 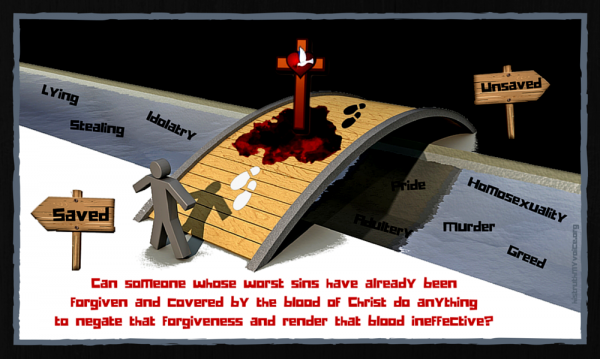 Would it happen after he had committed a certain number of sins, or, once he had committed a particular kind of sin? In other words, would it be the quantity or the quality of his transgressions—or, perhaps a combination of the two—that would push him out of the righteous camp and back into the camp of the wicked? And, if this could happen, just how was he to know if and when he had crossed over? Would an angel of doom suddenly appear on his doorstep with a message informing him of the transfer; or, would he come to know it as he found himself, going through life, with a dark cloud hanging over his head? Can We Really Lose Our Salvation? Of course, no one that I knew at the time had any answers to these questions—nor, could I find any in the Bible. And, that’s because, once I got around to checking out the verses usually used to support this theory, I found that, more often than not, they had been taken out of their immediate contexts, and out of the overall context of the Bible, as well. As examples of what I mean, here are some of the verses that I reviewed, along with a brief description of the contexts in which they are found. I will leave you to judge for yourselves whether or not they really support the position that a person can lose his or her Salvation. The Context: Here, Jesus is preparing to send out His twelve disciples to minister on their own, charging them to confine their ministry to Israel and not to take it to the gentiles. He warns them that, because of their association with Him, they will be persecuted and encourages them to stay strong through the opposition. The Context: In the Olivet Discourse, when the disciples asked when the temple would be destroyed, Jesus warned that it would be at a time of great tribulation, when many false Christs and false prophets would arise, and when they would experience intense persecution. The last statement in this verse was intended to encourage them to remain faithful through whatever challenges they may have to face. The Context: Jesus admonishes his disciples to be ready for His return at any time and uses a parable contrasting the reward waiting for a faithful servant and a faithless servant to make his point. In the parable, the faithful servant is the one who believes his master and behaves accordingly, while the unfaithful servant proves his unbelief through his mismanagement and abuse of others. The Context: The fig tree in this parable speaks of Israel and of her failure to produce the fruit that she should have. This doesn’t have application to an individual’s salvation. Context: This was directed to some Jews who professed belief in Jesus. But when He said this to them, they took issue with the part where He said they would be free. As descendants of Abraham, they claimed that they had never been enslaved, so they didn’t need to be set free of anything. In their response to Jesus’ statement, they revealed that they hadn’t come to faith at all. Context: In the last of His seven “I Am” statements, in His farewell discourse in the Upper Room, Jesus declares Himself to be the True Vine—in contrast to Israel. The implication is that those in Israel who do not come to true faith in Jesus will be cast away as unfruitful dead branches, while those who do come to faith will remain in Him and bear fruit. Context: Once again, the branches referred to here are the Jews who, because of their unbelief, were cast off. Paul is admonishing the Gentile believers to not be arrogant toward the Jews because they had been grafted into the Vine. Instead, they are to be reverent and grateful for God’s kindness to them for, if He judged the unbelief of the Jews, He will also judge them for their pride and arrogance. The Context: Paul uses the metaphor of an athlete training for a race to describe his approach to ministry. In the same way that an athlete endures the rigors of training so that he may run and win the race, Paul endures whatever hardships are required to carry out his ministry and win the lost to Christ. The Context: To the Colossians who had become believers, Paul contrasts their conditions before salvation and after their salvation—reminding them that, because Christ has reconciled them to God in order to present them holy and blameless before Him, they should make every effort to remain steady and grounded in their faith. Context: Here, Paul is encouraging Timothy to stay strong as a minister of the Gospel—unlike those who claim to represent Christ but who have proven to be false teachers. He identifies two who fit that description, saying that they had been put out of the church for that reason. The Context: This relates to the false teachers that Paul has been warning Timothy about—and, about how they will infiltrate the Church in an effort to lead true believers away from the faith. The Context: In this passage, the writer is contrasting Christ with Moses—with Christ as the Son over the household and Moses as the servant. He then contrasts the followers of Moses with the followers of Christ. Moses’ followers failed to enter into the rest of God through their unbelief, but the true followers of Christ will prove their belief as they hold on to their faith in the midst of struggle and persecution. The Context: Again, recalling the unbelieving Jews in the wilderness, the writer admonishes those who hear the voice of God not to rebel and harden their hearts to the truth. Instead, they are to encourage and build up one another in the faith so that none of their hearts will become hardened by sin and unbelief. The Context: This is probably the most problematic passage for those who question the eternal security of the believer. However, I think it will begin to make more sense when it is interpreted within the context of the book in which it is found. The book of Hebrews was written to Jewish believers who were either being threatened with or undergoing persecution for their faith; and, because of that, they were being tempted to return to the “safety” of their original Jewish faith and rituals. The imagery used here is of one who has come to the magnificent feast that is offered in Christ, only to return, in comparison, to the table scraps being offered by life under the Law. Having just made a case for the superiority of Christ over every aspect of the Jewish religious system, here the writer encourages those being tempted not to abandon the former in favor of the latter, as Judaism could offer them nothing in the way of salvation—only Christ can do that. In essence, the writer is saying that salvation through Christ is God’s Plan A—His only plan—and, since there is no Plan B, they need to stick with it. The Context: Because Christ is the only way that anyone can be saved, for those who have heard the gospel of salvation through Him and rejected it—choosing instead to remain in their sinful conditions—there remains no other way for them to be saved. In their rejection, they have demeaned or “trampled underfoot” the sacrifice offered by the Son of God, so all they can expect is judgment and punishment as enemies of God. The Context: The “they” here refers to false teachers who appear to have come to faith in Christ but haven’t really. It would have been better for them to not have made a show of knowing Christ because they will be judged all the more severely for their deception, and for their attempts to lead others from true faith. The Context: Peter warns that false teachers are twisting Paul’s teachings, and admonishes his readers not to be deceived by them—but to grow in the grace of Jesus Christ and in the knowledge of the Lord. The Context: John’s readers had seen many leaving the church, so he tells them that their departures only indicated that they were not true believers to begin with. Warning that the devil is always at work trying to deny the Son, he encourages them to hold on to the faith that they had in the beginning. The Context: This is part of Christ’s letter to the church at Sardis, a church He described as being dead, despite its appearance of life. However, there still were a few in the church who were saved—ones whose names had been written in the Book of Life and would not be removed. The Context: Jesus, through John, warns that anyone who attempts to add to or take away from the inspired Word of God will be regarded as a false prophet and subject to death—the same fate as the false prophets in the OT. Instead of focusing on the more negative aspects of the question, perhaps it would prove more helpful if we approach it by looking at it within the context of the overall Story of the Bible—a story driven by God’s desire and plan to create a family for Himself. As we have learned in our three previous exercises in Salvation, this family was to be one made up of men and women from every tribe and nation of the world, who had originally been born as slaves to sin and death, but whose freedom had been purchased for them by the blood of Jesus Christ on the cross. Once forgiven and free, they were in a position to legally be adopted as the sons and daughters of God, and be placed into the family of God by the Holy Spirit—who would then begin the lifelong process of training these offspring of God to think, speak, and act like His children. With this in mind, then, let’s now go to a passage of scripture which will provide us with a picture of the security that every believer, as a blood-bought child of God, should expect to experience. 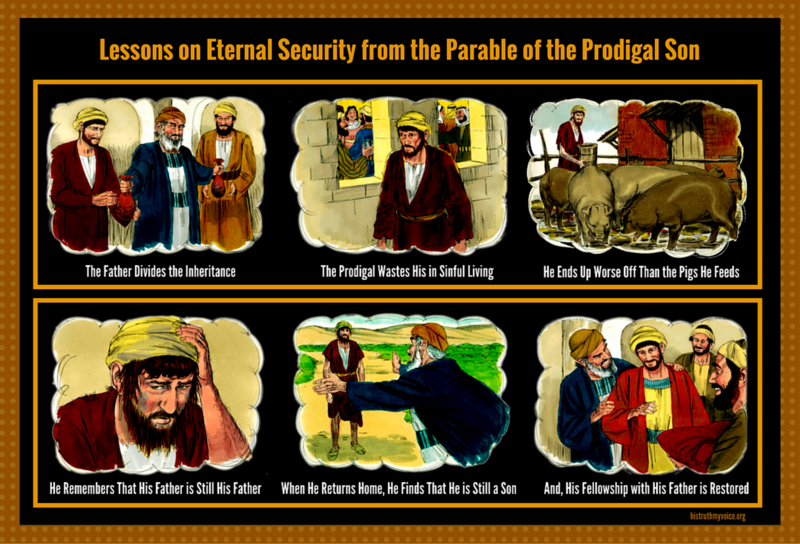 This passage is the Parable of the Prodigal Son and, while I cannot ever recall haven heard it used in support of a believer’s eternal security, I think it provides us with one of the best examples of it to be found in the Bible. As one of the best known parables, it tells the very familiar story of a father and his two sons; with the younger son, itching to get out and experience what the world has to offer, choosing to rebel against the authority of his father, while the older son remains at home and obedient to it. In its original context, this parable was given, along with the Parables of the Lost Sheep and the Lost Coin, in response to the Pharisees’ and scribes’ criticism of Jesus for His practice of associating with “tax collectors and sinners.” It was used in that context to illustrate God’s great passion for seeking and saving the lost; however, when viewed from the perspective of family dynamics, it provides us with the reassuring picture that, no matter how far away from God we stray, His love for us remains the same and our position in His family is never in jeopardy. 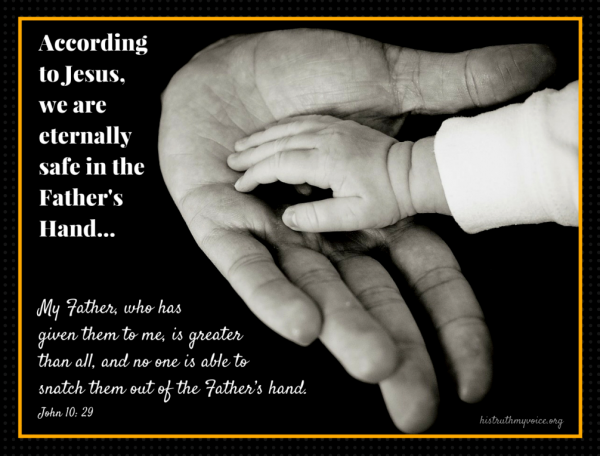 And he said, “There was a man who had two sons. And the younger of them said to his father, ‘Father, give me the share of property that is coming to me.’ And he divided his property between them. Not many days later, the younger son gathered all he had and took a journey into a far country, and there he squandered his property in reckless living. And when he had spent everything, a severe famine arose in that country, and he began to be in need. So he went and hired himself out to one of the citizens of that country, who sent him into his fields to feed pigs. And he was longing to be fed with the pods that the pigs ate, and no one gave him anything. But when he came to himself, he said, ‘How many of my father’s hired servants have more than enough bread, but I perish here with hunger! I will arise and go to my father, and I will say to him, ‘Father, I have sinned against heaven and before you. I am no longer worthy to be called your son. Treat me as one of your hired servants. And he arose and came to his father. But while he was still a long way off, his father saw him and felt compassion, and ran and embraced him and kissed him. And the son said to him, ‘Father, I have sinned against heaven and before you. 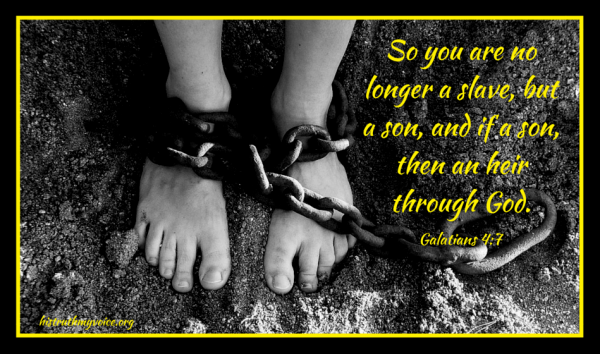 I am no longer worthy to be called your son.’ But the father said to his servants, ‘Bring quickly the best robe, and put it on him, and put a ring on his hand, and shoes on his feet. And bring the fattened calf and kill it, and let us eat and celebrate. For this my son was dead, and is alive again; he was lost, and is found.’ And they began to celebrate. When he repented and returned home, he discovered that to his father, the son was still his son. In other words, the son’s sins did not, in any way, negate the Father-Son relationship—in fact, it remained intact the whole time that the son was living in the world. What they did do, though, was sever the fellowship between the two during the period of the son’s estrangement; and, ultimately, rob the son of the future rewards that his inheritance would have otherwise brought him. So, it wasn’t his position in the family which was lost—it was his fellowship with his father, as well as any future rewards for faithful service. …is there anything that they can possibly do to undo their adoption, and cause them to lose their Salvation…especially in light of such promises as these from the Word of God? Posted in Biblical Reflections, Christian Living Reflections, Salvation Reflections, Workout Room Reflections. Tagged Adoption, Bible Teaching, Christian Living Reflections, Eternal Security, Faith, God, Holy Spirit, Jesus Christ, Righteous, Salvation, Saved, Unsaved, Wicked.